Cincinnati's Mercantile Library is one of an elite group of membership libraries that has survived into the 21st century. The library was established in 1835 which also puts it into the exclusive 175 year plus library club. I recently acquired an envelope that was mailed by the library on March 24, 1865 (see above). At that time the library was named the "Young Men's Mercantile Library Association of Cincinnati" and the envelope indicates that there were 21,700 books in its catalogue. 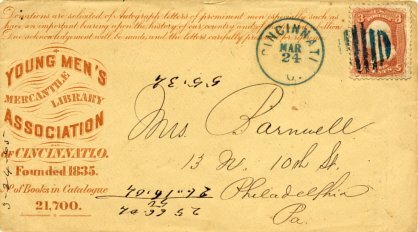 Of interest is the printed message at the top of the envelope which reads: "Donations are solicited of Autograph letters of prominent men especially as have an important bearing on the history of our country and of the recent rebellion. Due acknowledgement will be made and the letters carefully preserved for reference." The Mercantile Library in Cincinnati is one of the sixteen membership libraries that are included in the book America's Membership Libraries edited by Richard Wendorf (Oak Knoll Press, 2007). The article on Cincinnati's membership library is written by Albert Pyle, its Librarian. 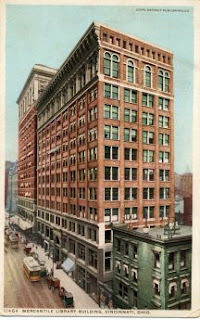 The most fascinating aspect of the library's history is the story of how its lease for space in the Mercantile Library Building (shown on postcard) came about. According to Pyle, the Mercantile Library moved into the Cincinnati College Building in 1840 but five years later the building burned. In return for a $10,000 advance on future rent in a new Cincinnati College Building, the library was granted a guarantee of space for 10,000 years. In 1869 just four years after the above envelope was mailed the new building also burned. The land, now vacant, on which the College Building stood became very valuable and a developer sought to build a multistory building on it. This could not be done, however, without the consent of the Mercantile Library because of its special lease agreement. As a result the Mercantile Library gained permanent free space on the 11th and 12th floors of the new commercial building which was named the Mercantile Library Building. As Pyle indicates "It is a very good lease." Like the other membership libraries that survive, the Mercantile Library in Cincinnati has had to redefine itself over the years. It has become a literary and cultural institution which sponsors a variety of programs and lectures in addition to the continued lending of books.